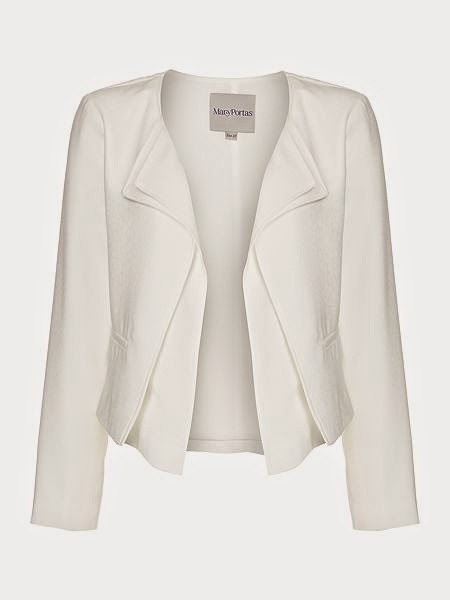 A jacket that's not a blazer.....in black AND cream! As soon as I'd found myself my transitional coat, the weather perked up considerably and I decided I needed a short black jacket that wasn't a blazer. 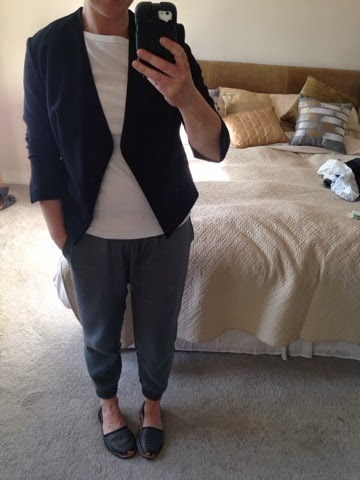 I think I was mostly prompted by this post from Andrea where she showed some amazing Pinterest photos of black blazer style jackets with khakis. Totally sold. I had a hoke about online and found this one in Next which ticked a few boxes. Next day ordering meant it was at my door about 18 hours later. I will never tire of this service! Then I saw this beauty in cream and it got me all in a tizzy. I love cream and it loves me too. Totally my colour and it just lifts an outfit so much (cue Pinterest hunt to confirm)...it's from Mary Portas at House of Fraser. All told, I'm not sure. 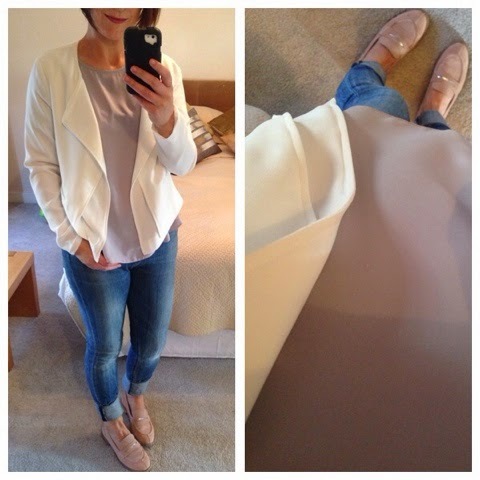 It feels waaaaay too dressy - even when dressed down with a sloppy grey t-shirt & trainers. I also tried it with printed tops or stripes and it didn't look right either. Properly gutted. To take my mind off jacket decisions, I'm going to write another blog post about my absolute find of a denim dress. This one is amazing, well priced and perfect if you're fed up of tunic style, shapeless, way too short denim dresses that have zero stretch in them and are impossible to put on. I've solved all of those frustrations with one high street option! Will update on the jacket situation in due course :) Happy Friday! You know of course, that I'm now sitting on my hands telling myself that I DO NOT NEED that Mary Portas cream jacket!!! But I think you're right - it's a bit too dressy for the school gate. Waiting with bated breath to see what you decide to do (*whispers* return the Next one and get the black MP one!!!!) Have a lovely weekend. What Helen says up there. The MP one will rock your world more. Lovely for a lunch out (wink, wink), event or evening too. I think it would be gorgeous with khaki trousers or over a little dress. I struggle to wear cream (or any light colour), need to layer with deep/dark top, accessories, bold make-up etc... if I could carry this off easily, I so would! I think the cream is heavenly Avril - keep it! 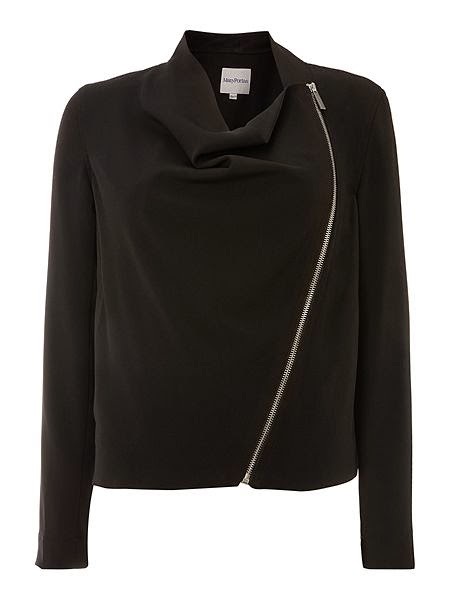 Both the Mary Portas jackets get my vote Avril, just stunning. The cream one is fab on you! And I don't agree with you - it is FINE to wear on a casual basis!!! 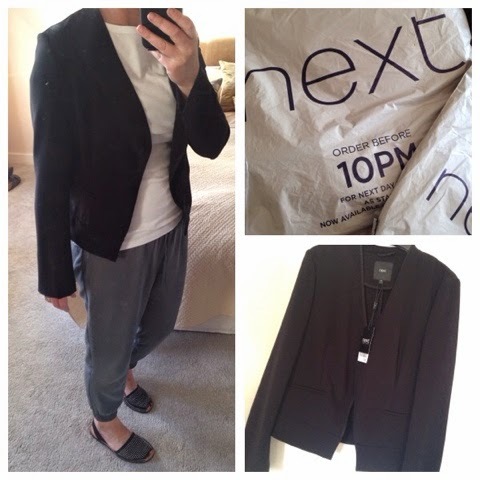 What a versatile jacket...dressed up or done. You have got to keep it! Re the black one, check first what the second Mary Portas one looks like unzipped...which is pretty much how you'd wear it...before you make up your mind. You might find it looks rubbish after all! BTW...I LOVe your Hush Avignon trousers. I have been so tempted by them after struggling to find khaki trousers. Can you tell me if they are true to size - and, as always the risk with me (I must be long bodied) the crotch - low slung or a good fit?!! Oh and you are totally right re the MP black jacket - I'm not sure it's going to work as it looks a bit odd open. I tried it today. Back to the drawing board on the black one but I think I will keep the cream one and try it out a few more causal ways. Michael Kors opens in Belfast! Breton & Denim Dress Perfection!